Background: People with severe mental illness (SMI) are more likely to experience criminal victimization than other community members. In addition, (self-) stigma and perceived discrimination are highly prevalent in this group. These adversities in the social context often have major adverse effects on the rehabilitation and recovery of these persons. Current practice, however, lacks instruments to address these issues. As a reaction, the Victoria intervention was developed and pilot-tested with client representatives, professionals, trainers and researchers. The Victoria intervention is a method for community mental health care workers to expand their awareness of this topic and support them in assessing victimization and incorporate appropriate services, including trauma screening and rehabilitation services, in their health care planning. For clients, the Victoria intervention aims to increase their awareness, active management of possible victimization risks and promote safe social participation. As a new intervention, little is known about its use in real practice and its effects on client outcomes. Methods/design: To determine the feasibility and effectiveness of this intervention, a process evaluation and a first cluster randomized controlled trial (RCT) will be carried out. Outpatients from eight Flexible Assertive Community Treatment (F-ACT) teams from two mental health care (MHC) organizations in the Netherlands are included in the study. Teams in the intervention group will receive three half-day training sessions, and bi-monthly supervision meetings for 18months. Teams in the control group provide care as usual. For the process evaluation, a multi-method design is used. To assess effects on client outcomes, clients will be interviewed about their experiences on victimization and societal participation using validated questionnaires at baseline, and after 9 and 18months. 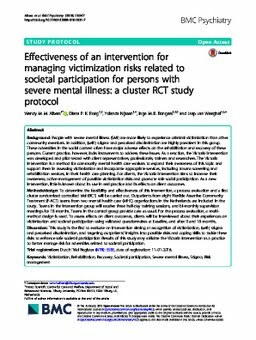 Discussion: This study is the first to evaluate an intervention aiming at recognition of victimization, (self-) stigma and perceived discrimination, and targeting outpatients' insights into possible risks and coping skills to tackle these risks to enhance safe societal participation. Results of this study may validate the Victoria intervention as a practice to better manage risk for adversities related to societal participation.